A commitment is understood as a pledge made by UN Member States, the private sector, civil society and other international stakeholders, to provide financial resources or policy assistance with the aim of achieving developmental goals. The IIF was set up by the Secretary-Genera of the United Nations in order to monitor and track financial and policy commitments made by UN Member States and other international stakeholders towards meeting the MDGs. Learn more about us here. The MDG Gap Task Force was created by the Secretary-General of the United Nations to improve monitoring of the global commitments contained in MDG 8, the Global Partnership for Development. 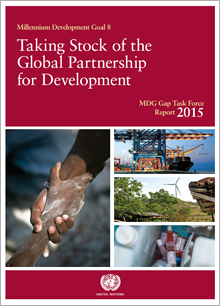 Learn about the MDG Gap Task Force here.